Black holes form when a very massive star dies and its core collapses into a space so small that not even light can escape it. The boundary that delineates that point of no return is called the event horizon, and a sort of opaque “wrapping” that doesn’t let you see the singularity itself. Importantly, as matter falls into the black hole, the event horizon grows: rapidly at first as the black hole begins to form, then more slowly as matter falls in at a lower rate. The black hole hypothesis is a lot cleaner, if mind-bendingly hard to picture. 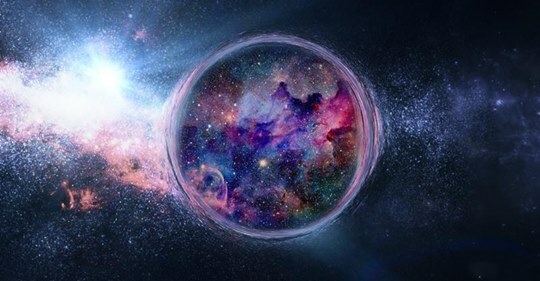 We might live in a universe within a black hole within a universe within a black hole. It might just be black holes all the way down. For more on the beginnings of the universe, check out Stephen Hawking’s classic “A Brief History of Time.” The audiobook is free with a 30-day trial of Audible. We handpick reading recommendations we think you may like. If you choose to make a purchase through that link, Curiosity will get a share of the sale.